Explore the Panorama Route on either a full day trip from Sunbird Lodge or travel via the route on the way to your next destination from Phalaborwa. 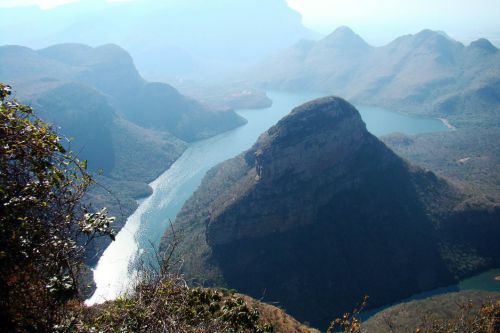 On the Panorama Route in Mpumalanga, with its breathtaking vistas around every mountain corner, waterfalls plunging down faces of sheer rock, memories of the gold rush following you as you meander down an endless river canyon, and eagles hovering above your head – you can’t help walking with your head in the clouds. One breathtaking view after another – that’s South Africa’s famous Panorama Route, where you’ll experience mountains, sky, forests and the truly impressive Blyde River Canyon, one of the world’s largest canyons. The small town of Graskop is the gateway to the Panorama Route. It’s a good place to set up base. Scenic landmarks with evocative names like God’s Window, Wonder View, the Pinnacle, Bourke’s Luck Potholes and the Three Rondawels beckon. The awe-inspiring Lisbon Falls, Berlin Falls and Mac Mac Falls are also just a short drive away. Adding some historical romance into the mix, half an hour’s drive from Graskop, the goldrush town of Pilgrim’s Rest gives you the chance to relive the 1873 goldrush in surroundings of unparalleled beauty. You can even try your hand at panning for gold. 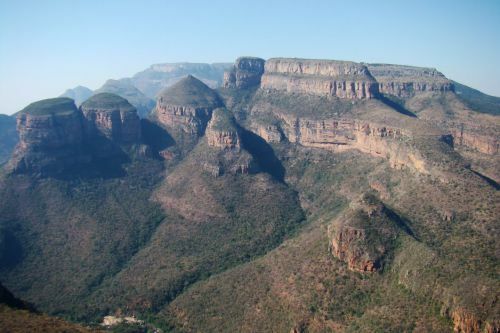 From Graskop, head on to the Blyde River Canyon Reserve. Thread your way along the cliff tops 800m above the Blyde River Canyon, and at God’s Window, be sure to walk in the thick, indigenous mist forest that’s often among the clouds. The Bourke’s Luck Potholes are also well worth a visit. 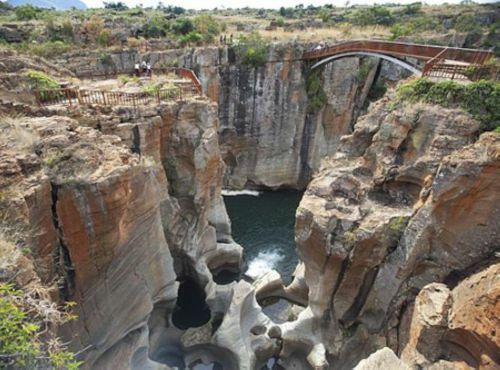 These giant potholes have formed at the confluence of the Blyde and Treur rivers and mark the beginning of the Blyde River Canyon. Although the visual element dominates on the Panorama Route, all your senses are enriched by the wealth of plant and animal life that the region supports. Mammals you might see along the Panorama Route include klipspringer, dassies, grey rhebuck, oribi, kudu, bushbuck, bushpig, monkeys, bushbabies, chacma baboons and black-backed jackals. This area is also rich in birdlife including eagles that might well look you in the eye. Some of the Panorama Route’s lesser-known but no less fascinating attractions are clustered around Ohrigstad. Echo Caves extend for 40km into the rock, a limestone fairyland. At Ohrigstad Dam Reserve you can fish for yellowtail or carp on tranquil waters surrounded by mountains, an ideal refuge from the crowds in peak season.